For no particular reason whatsoever, I've been maintaining a list of movies and television shows where sewing machines can be spotted. Some are shown long enough to be identified, some are just brief glimpses. Feel free to e-mail me with any you come across, and let me know if you can positively identify the make and model. If not, send it along anyway with your best guess. Batman Returns (1992): shown as a "Belvedere"
Clara's Heart (1988) Far shot of a portable, black Singer, on its wooden base. Dr. Zhivago (1965): Handcrank in Lara's Siberian flat. Finding Neverland (2004): treadle something-or-other...and Johnny Depp! 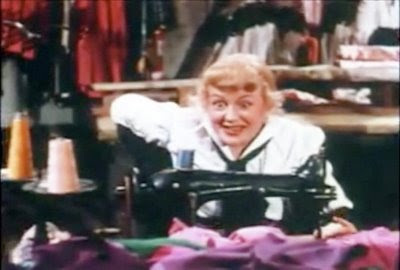 Mother Wore Tights (1947): Betty Grable sews up her fabulous 1890's designer showgirl wardrobe on a NF type treadle. Others, The (2001): Looks like a handcrank/treadle combo; the room was very dimly lit, so it was very hard to see details. Sweet Dreams, The Patsy Cline Story (1985): possibly a 127 treadle, and a Godzilla _____? Jericho: Treadle table against the wall between the kitchen & living room at the Richmond ranch. Monk: Mr. Monk Goes to the Ballgame (2003): Treadle base only (!) used as a foyer table. Seinfeld: Episode #149 "The Pothole" (2/20/97) Kramer 'adopts' a mile of the freeway. A Singer 99 sewing machine falls off a dump truck and is shown bursting into flames caused by igniting paint thinner. 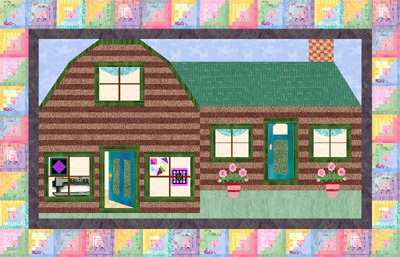 Six Feet Under (HBO 2001) The daughter found her grandmother's sewing machine in the attic. While high on drugs with a girlfriend she makes her mother very colorful slacks. The machine was dark green, full size, Singer 500. Nancy Drew: Frister and Rossman handcrank! Lilo and Stitch (2004): A little monster with a compulsion to clean house sucked up a whole treadle in his snout while the owner of the machine screamed for him to stop. He then blew his nose in the trash can and out popped the machine. The owner scooped it up and sniffeled that the machine had the original 1930's bobbin! Too funny! Texas Prison Museum, Huntsville Texas: During a video about the prison, a convict is shown using an industrial Singer to sew prison uniforms. Hey - we homeschool - it was a field trip! A coffin?! That was the time we were passed on the freeway by a beat-up blue pickup truck hauling a$$ with something really big in the bed, covered by a tarp. The window behind the cab had white shoe polish words written all over it: R.I.P. Gina. OMG - it was a coffin! A real damn pine box coffin! I nearly hit the guardrail trying to catch up to get a better look. The kids were screaming, and I was going 80 trying to dig my camera outta the bottomless basket I carry all my stuff in. There were paper and plastic flowers sticking out of the cab windows, and the guest of honor must have been late. They were definitely heading for the border. A quick call to 911 and we found out it's perfectly legal for any old Joe - or Jose - to drive around Texas with an occupied coffin! Don't forget Project Runway, now in it's 11th season. We see sewing machines all of the time on it. The Dressmaker is a new movie based on a book....should watch this too. I thought I was the only one that looks beyond the movie/TV/series -- looking and relating to decor I usually want to copy! The film "Labor Day" has a sewing machine in the living room atop a sewing cabinet. This is a wonderful blog, that I enjoyed reading. I'm a fan of the vintage Kenmore machines; not many of them [if at all] are featured. Singer wins overwhelmingly! This is just a delightful read; thank you kindly.